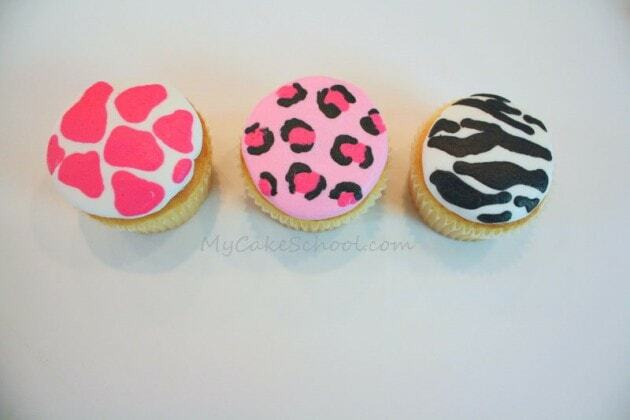 Learn to make adorable animal print cupcakes in this free step by step tutorial! 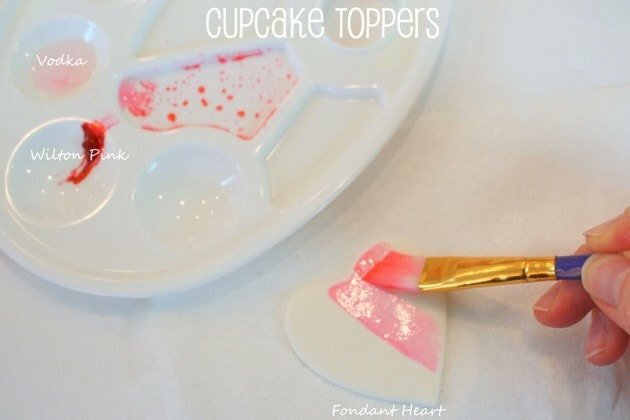 These cuties are perfect for Valentine’s Day, anniversaries, and more- and you’ll love how simple they are to make! Well, it’s officially Valentine’s Day season…. 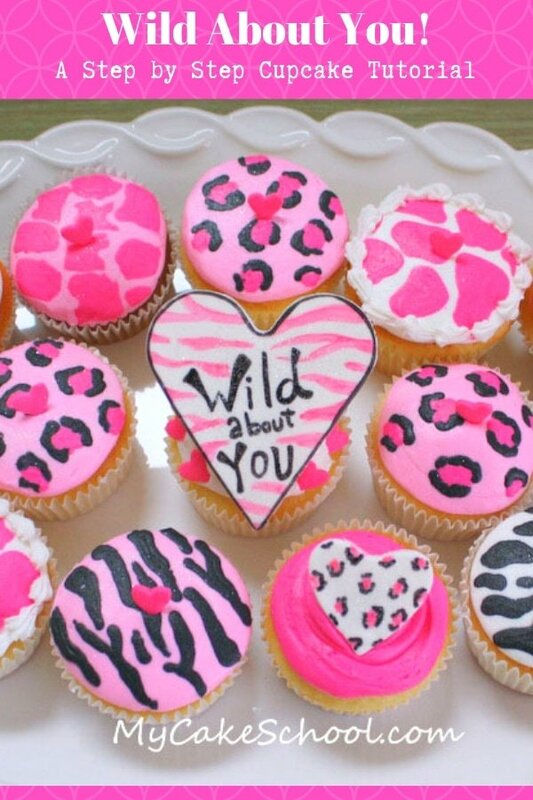 I feel like we could all use a dose of lovey dovey sweetness –Especially if it involves….ANIMAL PRINT! 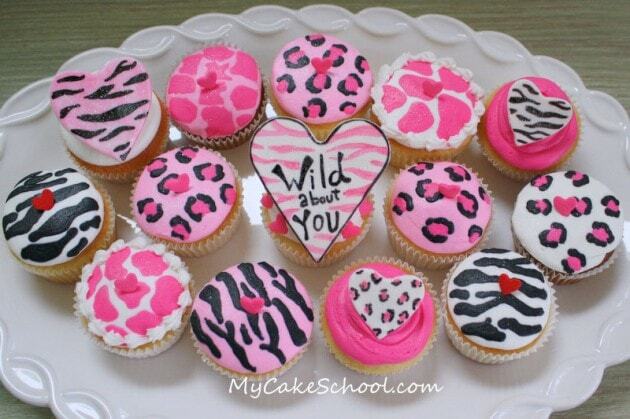 How I do love animal print :0) — And even more when we throw cupcakes into the mix. Today’s theme is “Wild About You”. Who are YOU wild about? Your hubby, your kids…the mailman ;0) –Whoever they are, they are going to love these…. Crusting Buttercream (important if you want a smooth finish). I tinted mine with Wilton Pink, Americolor Electric Pink, & Americolor Super Black. Our Classic Vanilla Buttercream or Fluffy Vanilla Buttercream recipes are good options! 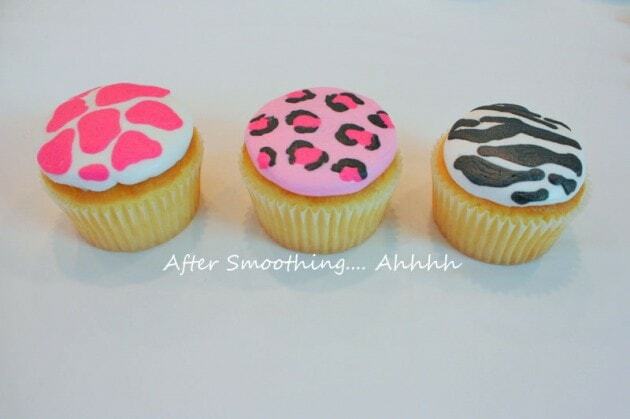 In this cupcake tutorial, I’m going to demonstrate how to create animal print buttercream while using a crusting vanilla buttercream frosting (links are beneath our Materials). 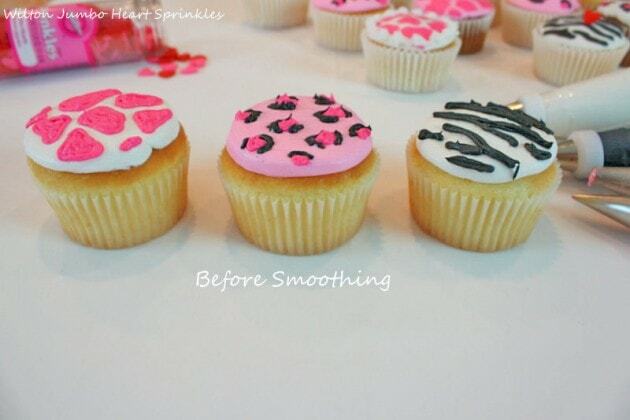 We’re also going to show you how to paint designs onto fondant cupcake toppers! Pick and choose from your favorite designs- there’s something for everyone! I started out by piping on my base coat of frosting with a tip 12 (a larger round tip is fine too.) 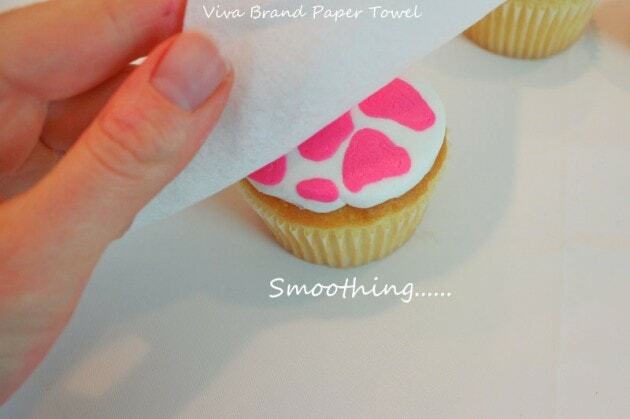 –Once crusted, I smoothed with a Viva brand paper towel. If you’d like to see more on this technique–click HERE. Oh so pretty! It’s the magic of a crusting buttercream! I thought it would be fun to make some animal print toppers also– we decided to go with zebra print and leopard print. 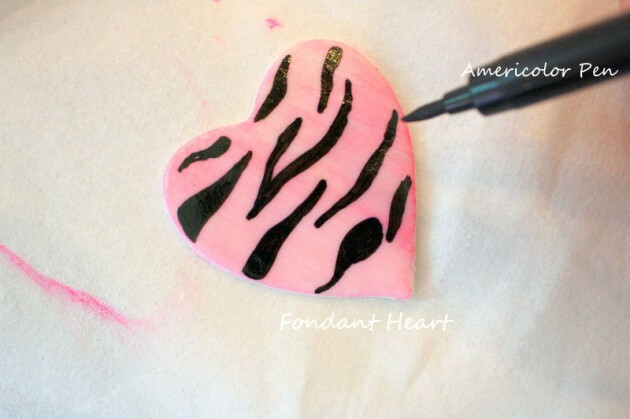 Then, I painted some of my hearts with a “base coat” of pink paint. I made my paint by mixing pink coloring gel with a small amount of vodka. (Lemon extract works also)– The alcohol evaporates quickly, leaving the color behind. After about five minutes, the surface was dry and I was able to use my food coloring pen to draw on some zebra stripes! These are so cute resting on top of a swirl of buttercream. That’s all that there is to it! 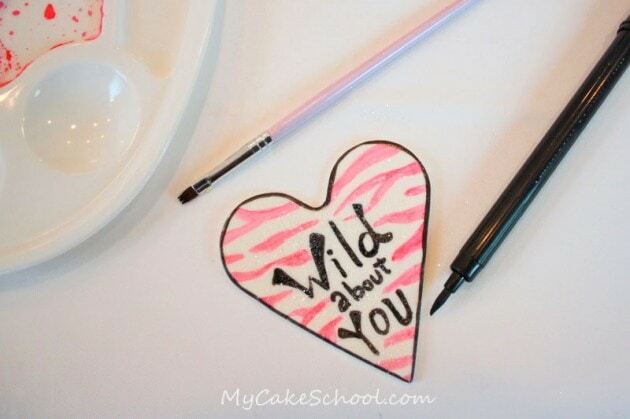 For More Valentine’s Day Cake and Cupcake Decorating Fun…. 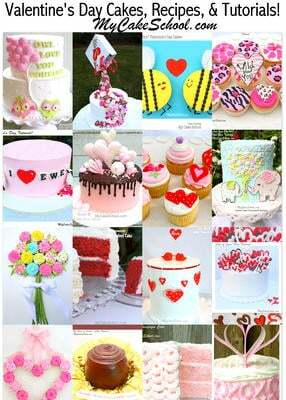 Don’t miss our full roundup of FAVORITE Valentine’s Day Cakes, Cupcakes, Tutorials, Recipes, and Ideas! Valentine’s Day is one of my favorite holidays- there are so many cute and creative design options! Don’t miss our other fabulous tutorials in our Free Tutorials Section— we have a free video tutorials subcategory also if you’d like to check it out! For those of you who would like to have full access to the hundreds of cake decorating video tutorials that we’ve made over the years, you should consider becoming a member of My Cake School! You can find all of the details here: Joining Information for My Cake School. The Very Hungry Caterpillar–Pull-Apart Cupcake Cake Tutorial! Just letting ya know Melissa, I’m using this tutorial to help me through my culinary school finals. We are decorating cupcakes using a theme we picked at random. I got valentines day! These will be so cute. @Aliys, yay! That makes me so happy. ;0) —Good luck, I know they will be fabulous! I will post pics :) I totally fat fingered the keyboard & misspelled my name in that 1st post. Doh! About Americolor pens. I’ve also had issues with the Wilton ones! What equipment an supplies did you use for this creation? Want to try for my niece party next month.